Boy baby shower ideas don’t get any cuter than those created by Brittany of GreyGrey Design! She always uses unique supplies and decorations to carry out amazing party themes. 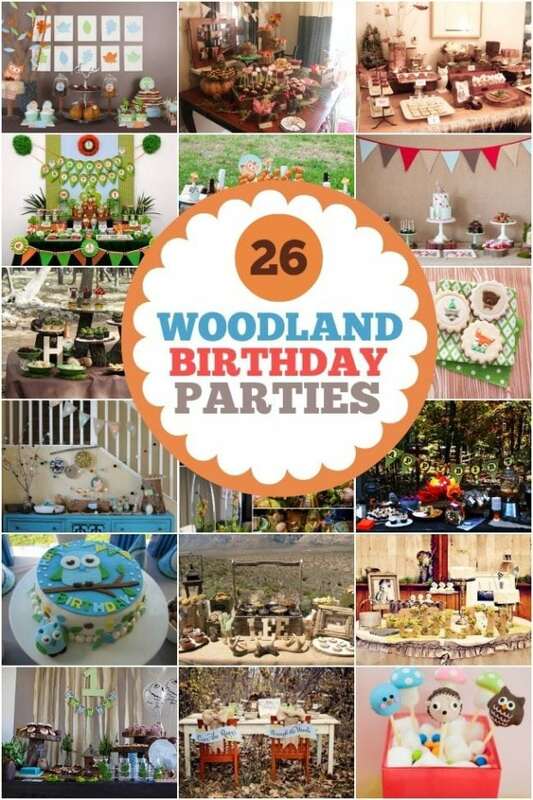 This time she has produced an adorable woodland forest baby shower. Menu choices reflect the theme and even the invitations match the cake pops! Brittany first got the idea for this shower when she learned what the baby boy’s name was going to be: Silas. The meaning of Silas is “from the forest”. That information, coupled with the mama-to-be liking brown and blue, produced the woodland forest theme. These owl cupcakes would be perfect with this woodland themed baby shower. A faux bois fabric was used as background for the dessert table. The next piece Brittany decided to use was the colorful “God Eyes” that are suspended above both food tables. Foam core, moss, wooden dowels, glue and determination were used to build the conifer replicas. Don’t they look terrific? As Brittany says, these would also be great as Christmas decorations, too. Serving platters were made with basswood plaques glued to raw wood candlesticks. Some type of green glass plate could have been used, but these types of extra touches are part of what make Brittany’s work so interesting. Basketweave and “grass” add more texture. Faux bois Oreos and S’more Bites build on the woodland idea and the cakepops are darling renditions of woodland creatures. Oh, Creative One! produced the party printables, including the banner over the savory food table. Additional moss conifers, cedar logs and burlap bring more of the outdoors inside. Even the menu choices enhance the party theme: tortellini twigs with moss dip (pesto sauce), pinecone cheese balls, broccoli salad, toadstools (tomatoes and cheese) and tree trunk tenderloins (sandwiches). Guests were thanked for “giving baby Silas s’more love” with s’more favor bags to take home. Brittany packs a lot of inventive touches in her parties; I imagine that attending one of her events is an entire sensory experience! Make sure to follow GreyGrey Designs on Facebook and Pinterest to see all of Brittany’s awesome ideas! Get more boy baby shower party inspiration with these ideas.